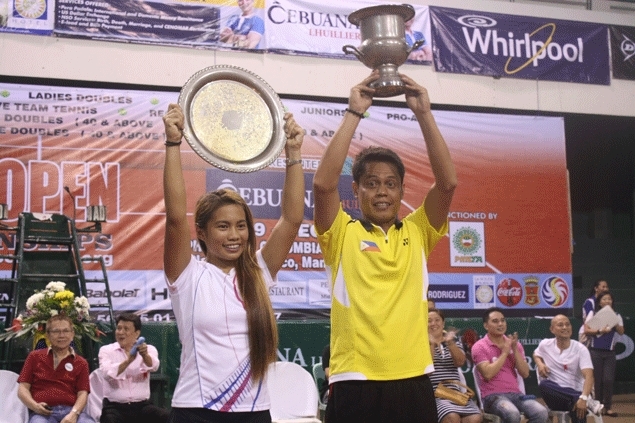 Johnny Arcilla (right) and Marian Jade Capadocia raise their respective trophies after topping anew the men’s and women’s singles of the PCA Open tennis championships at the Philippine Columbian Association. TOP seeds Johnny Arcilla and Marian Jade Capadocia completed their respective three-peat bids as they retained the men and women’s titles at the close of the 32nd Philippine Columbian Association (PCA) Open tennis championships at the PCA covered clay courts in Plaza Dilao in Paco, Manila. Arcilla downed fourth ranked Marc Reyes, 6-1, 6-4, 6-2, while Capadocia escaped with a 6-1, 7-5, 6-4 decision over No. 2 Anna Clarice Patrimonio to reign anew as champions of the country’s longest-running tennis tournament backed by Cebuana Lhuillier and sanctioned by the Philippine Tennis Association with Dunlop, Babolat, Head, Pag-ibig and Fujidenzo/Whirlpool as co-sponsors. The 33-year-old Arcilla copped a record eighth title overall to become the winningest netter in the history of the tournament. He also pocketed the P100,000 champions purse. Capadocia, meanwhile, had to gather her wits after Patrimonio took a 4-3 lead in the deciding third set following a 7-5 win in the second frame that forced the rubber. “Iniisip ko lang na hindi pa tapos ang laban. Hangga’t hindi siya nakaabot ng six, may chance pa ako. Lumaban lang ako at nag pay off naman,” said Capdocia. She now joins the ranks of three-time winners Sarah Rafael (1986-1988) and Maricris Fernandez (1989 to 1992), while a fourth title next year could match the four-year reign of Jennifer Saret from 1989 to 1992. Czarina Arevalo holds the record for the most number of wins in the distaff side with five (2002 to 2003. 2005, 2007 and 2009). Both Arcilla and Capadocia also celebrated twice as they likewise ruled the doubles event with their respective partners. Arcilla joined Kyle Dandan in beating the second-seeded pair of Leander Lazaro and Ronard Joven, 6-3, 6-7 (5), 6-2, while Capadocia partnered with sister Jella Jade in defeating Sarah Jane Lim and Nicole Eugenio, 6-1, 6-3.